Nicole Orabona and Ian Potter in The Aurora Project. Photo by Dawen Huang..
BOTTOM LINE: Sci-fi fans will relish Bella Poynton’s ambitious universe and curious characters more than the aesthetic of these elements onstage. Out in the seemingly endless vacuum of space, a complicated yet diminutive community flies the Aurora, the eponymous explorer spaceship of Bella Poynton’s new sci-fi play, The Aurora Project. Commandeering the vessel into mysterious territory, Nora (Nicole Orabona) falls mortally ill to an unknown virus while her curious android assistant Constantine (Ian Potter) juggles decisions to keep the one person he loves alive. 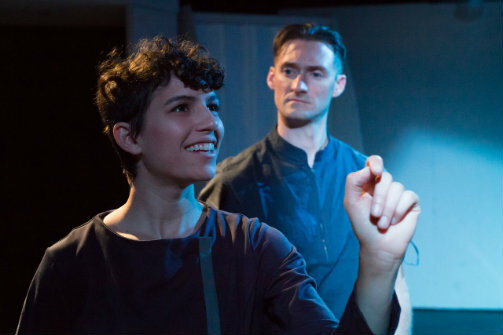 Presented by The Navigators, a feminist science fiction theater company, and directed by Jesse Kane-Harnett, Poynton’s Aurora charts Asimovian distances through the eyes of characters who explore still unanswerable questions in human and artificial relations themselves. Poynton’s malleability of time within the vastness of her universe should hook sci-fi fans even if Potter’s scenic design and lighting relinquishes the sleekness Hollywood would’ve wished for the titular ship. It is Poynton’s Asimovian universe that could very well engender spinoffs that continue building the worlds, questions, and generations started with The Aurora Project. And, boy, do generations pass. Brighter as an actor, Potter’s Constantine is the one who induces Poynton’s astronomically monumental timeline, letting the universe mature in hopes of finding a cure for Nora. Time might brilliantly disprove his status as a cyborg in between poignant flashbacks, existential interludes, and heart-breaking choices. Potter’s non-binary approach to a multi-layered simulacrum of humanity makes up for a less dimensional Nora even if Orabona seals the cracks in her character with a strict, but shaded, rendition. Actually, the non-human characters seem to be more compelling than human Nora, which could say a lot in itself: Poynton’s more invested in the intelligence we have yet to discover. Enter characters like polite Questry (Michael DiSantis) whose otherworldly intellect is not enough to cure the ship’s captain, or sinister Gatekeeper (Amelia Fei) whose reason to infect Nora goes beyond human interests with reason. Even The Designer (Joel Austin), a hologram personifying the ship’s operating system and creator, gets a better treatment with a scientifically wicked past regarding Nora and Constantine. It’s unfortunate The Navigators present themselves as a luminous feminist theatre company but seem to have left Nora hanging as a mostly undemanding character whose trip into a love interest ends up being less than what she truly has to offer. Regardless, Poynton’s universe deserves growth and should be worth the same amount of exploring Constantine and Nora impart. The Aurora Project might be something we’ve seen before in terms of human-robot exploration. Yet, with hard sci-fi like this, it shouldn’t be that much of an obstacle. Poynton’s interrogations are ones that have stood the test of time inside her narrative as well as in art. They deserve a larger stage (on the page and off) we’ve yet to see. As for now, we only get to see the edges of this universe with Constantine, and possibly find out nobody’s intellectually perfect after all…yet. The Aurora Project is by Bella Poynton. Directed by Jesse Kane-Harnett. Scenic Master is Ian Potter. The cast is Nicole Orabona, Ian Potter, Joel Austin, Michael DiSantis, and Amelia Fei.